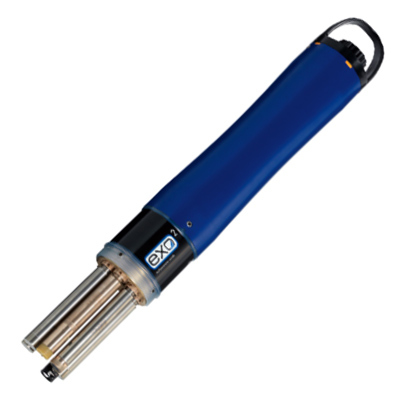 The new EXO2 sonde, with 6 ports and a central anti-fouling wiper. Parameters include: Temperature, Conductivity, Depth, Dissolved Oxygen, pH, ORP, Total Algae (Blue-green Algae and Chlorophyll), Turbidity, and fDOM, plus 4 calculated parameters. Automatic routing enables a string of sondes to pass messages to individual probes. Any time the conﬁguration changes, the system automatically recognizes it. A “kick” allows any device to send alerts back up the chain. - No depth sensor installed - AUX port for future expansion - Contains: Sonde, 4 ""D"" Batteries, Calibration Cup, Tool Kit, 4 port plugs, USB drive loaded with User Manual and KOR Software"
- Depth range: 0-10 meters - AUX port for future expansion - Contains: Sonde, 4 ""D"" Batteries, Calibration Cup, Tool Kit, 4 port plugs, USB drive loaded with User Manual and KOR Software"
- Depth range: 0-100 meters - AUX port for future expansion - Contains: Sonde, 4 ""D"" Batteries, Calibration Cup, Tool Kit, 4 port plugs, USB drive loaded with User Manual and KOR Softwaree"
- Depth range: 0-250 meters - AUX port for future expansion - Contains: Sonde, 4 ""D"" Batteries, Calibration Cup, Tool Kit, 4 port plugs, USB drive loaded with User Manual and KOR Softwaree"